***This is the first post of my Fall fashion event!! Stay tuned for many fun reviews/giveaways over the next couple of weeks! I've always been a fan of bangles but usually they don't fit my small wrist. Then I found Mango Tree Bangles which come in all different sizes. I chose three different bangles for my review in a size small and they fit great! 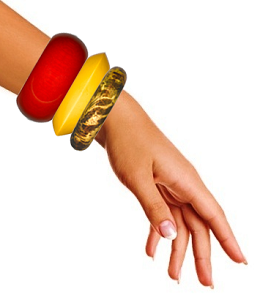 The bangles that I received are the bold tiger eye, the slim grapefruit, and the mother earth. The bands come in three different styles: slim, bold, and samba. The company sells tons of different colors and patterns of bangles. They have a section on their site where they combine different neat color combinations. These bangles are actually hand carved and painted from mango trees! 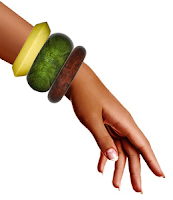 Here is some more information from the site about Mango Tree Bangles: The mango tree is only timbered for use when the tree can no longer yield fruit. Each bangle is designed and painted using special techniques and colors to give you a product that is in a class of its own. With 3 styles, 50 colors and 4 sizes; Mango Tree bangles are extremely popular amongst women of all ages. I love the bangles that I was sent and will be wearing them often! Thanks Mango Tree Bangles! Oooh, those are super cute!